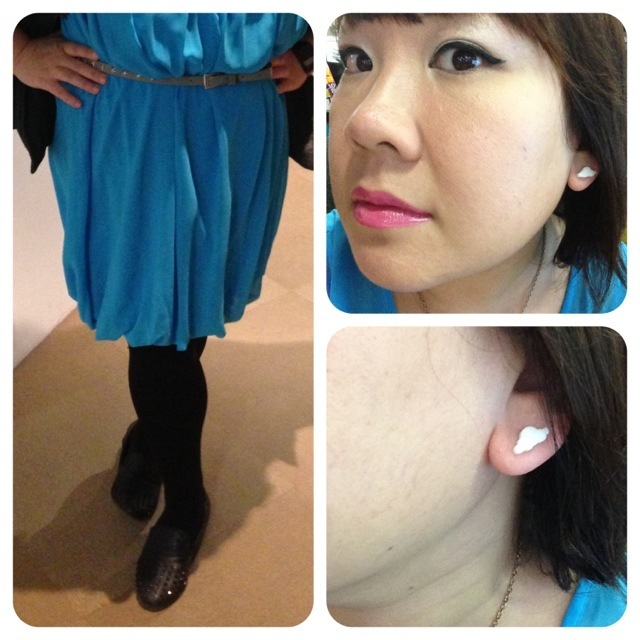 I’m wearing something I just wore recently (omg *gasp*). It’s really versatile and I really do love how it fits. Also, it has POCKETS! A tunic top/dress thing with pockets! As you can see, I didn’t bother ironing it after I got it off the line. It’s not doing too badly in my opinion. Also, I’ve been trying to find a way to feature this belt that my pal Ryddy gave me a few weeks back. It’s really cute and I love the buckle – the white leather skinny belt made it that little bit difficult though. I don’t like white in general so I didn’t have a clue how to wear this one. I hope it works though! 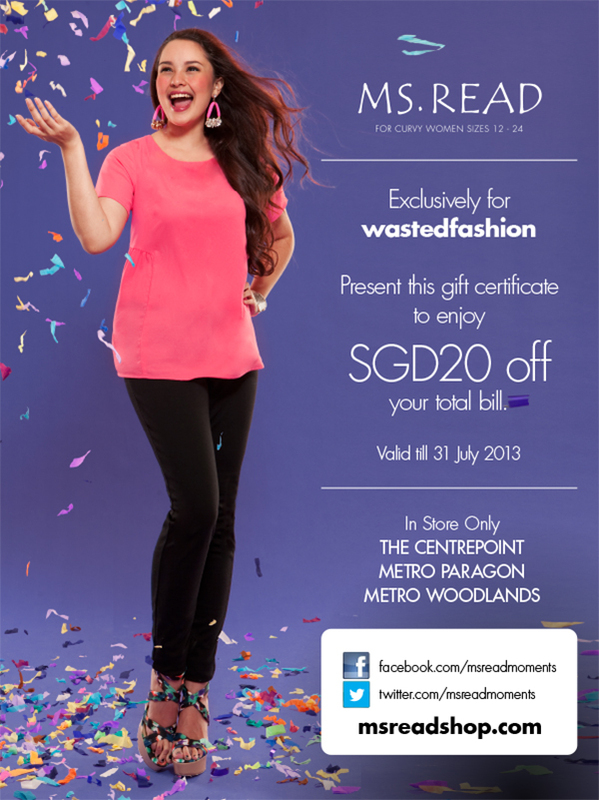 This MS. READ round-neck, long tabbed-sleeved tunic retails for SGD89 (only SGD69 if you flash the special wastedfashion SGD20 off flyer (when making purchase) from now till 31 July 2013. Also, if you’re interested in other specials, check out this page https://wastedfashion.wordpress.com/advertising-sponsorship/discount-codes-for-readers/ where I’ve listed all the discount codes you should use when shopping! 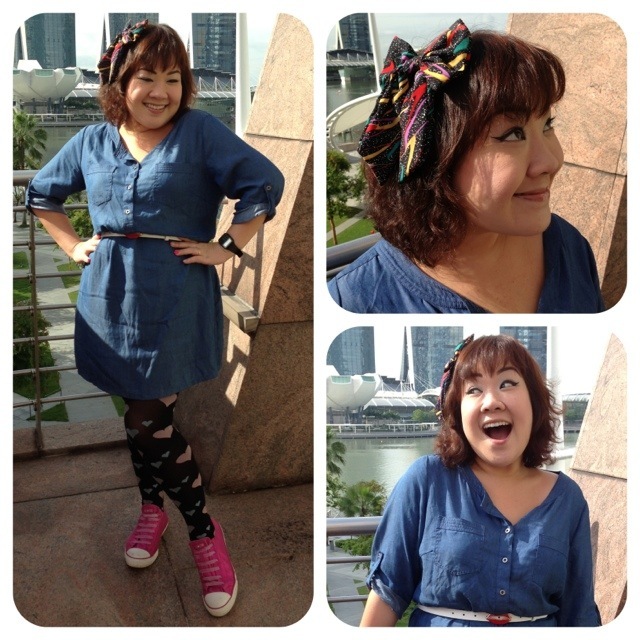 Categories: Fat-shionista | Tags: accessories, blogging, casio, converse, dress, Fat Friendly, Fat-shionista, fatshion, fatshionista, indie, indie designers, leggings, ms read, ms read moments, online shopping, outfit of the day, plus size, plus-sized, r by ms read, singapore, sneakers, topshop, what I'm wearing today, zara | Permalink. 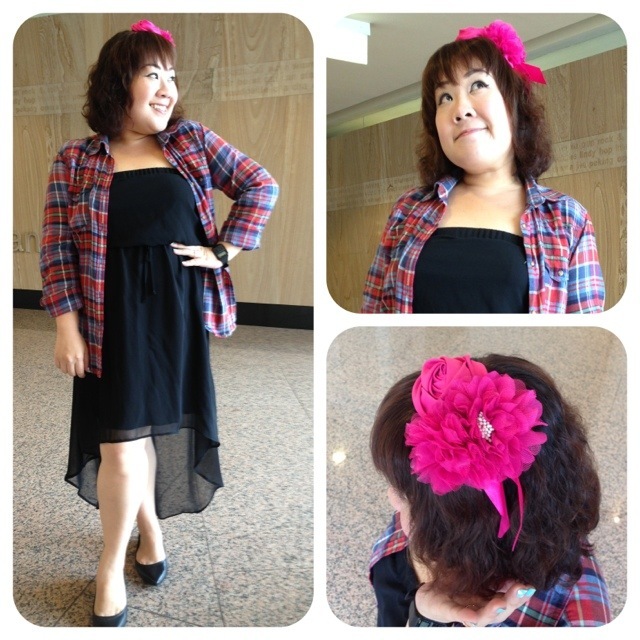 Anyway, I’ve been told that today’s get-up is quite unusual for me and I look more casual than on normal days. What can I say? I love this top a little too much to care! Also, it was raining when I left the house today! Thanks Shridar for the photos! 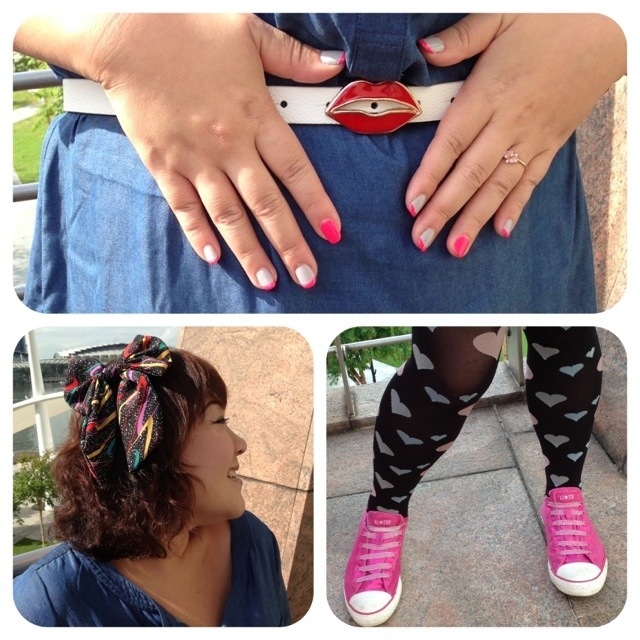 Categories: Fat-shionista | Tags: Ariel ballet flats, blogging, casio, hair bow, iphone, jeans, jersey top, le bunny bleu, little twin stars, new look, river island, sanrio, singapore, uniqlo | Permalink. Bought 7 of the 25 gifts I’m supposed to get and I’ve started counting down to my holiday! In less than 45 days, I’ll be back in Las Vegas. Then T and I will be travelling over several weekends (because he still has to work) to visit friends and family in California, Arizona and New York. YIPPIEE! Talking about New York, did you hear that LeBunny Bleu is now in Singapore? We don’t have to make the trek to their NYC headquarters anymore! 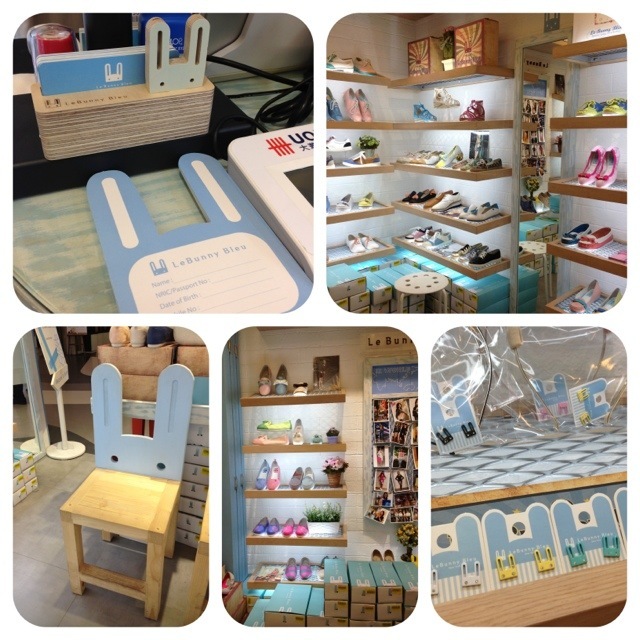 There is a LeBunny Bleu shop at Bugis+ (the mall formerly known as Illuma) and is located at the bridge connecting Bugis+ to Parco Bugis Junction. 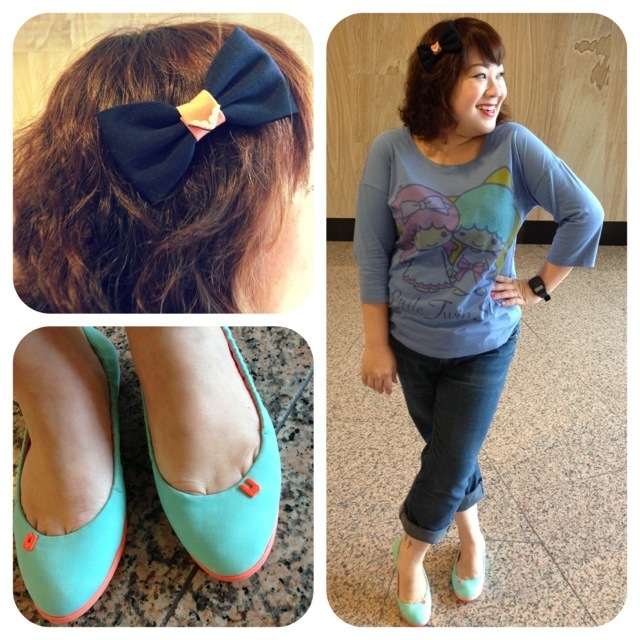 I love LeBunny Bleu for their quirky spins on classics like flats, canvas slip-ons, loafers and oxfords. And because they are mostly sensible shoes instead of ridiculously high heels, they’re exactly in line with my desire for comfort and style. 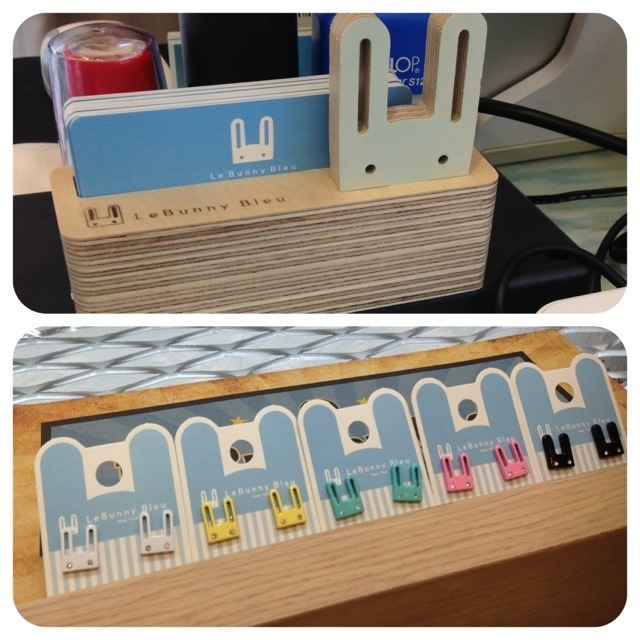 Also, how can you resist their adorable bunny logo? It’s on everything! You also get to sit on bunny chairs while trying out shoes in the store! Prices in Singapore are comparable to their US-based online store, ranging from SGD60 – 95. The benefit is that you get to touch and feel the shoes in person, as well as save on shipping charges! The Ariel Ballet Flats I’m wearing today are retailing for SGD61 but ask for the wastedfashion discount and pay only SGD54.90! With its headquarters in New York and more than 100 stores all over the world, including NY, London, Tokyo, Taipei, HK and Seoul, LeBunny Bleu merges romantic, vintage style with modern practicality in its women’s shoes. It’s expanded rapidly since its establishment in 2009, and recently opened its first Singapore store at Bugis+. Well-travelled Singaporean may also recognize them from Korea where they have a huge following and as such have their biggest presence. Worn by such stars as Yu-Na Kim (Olympic Ice Skater extraordinaire), the Wonder Girls (I want no-body, no-body but you, ooh ooh!) and K-Pop star Kim Huyana (from 4 Minute) recently on the cover of Vogue Girl; Le Bunny Bleu’s practical-but-ever-so-cute take on flat shoes are set to become your favourite wardrobe staple. On top of that, wastedfashion readers get 10% off their first pair and 20% off their third pair of shoes! (Usually applicable for 3rd and 5th pairs only). 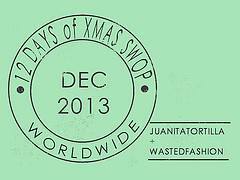 So don’t forget to ask for the wastedfashion discount when paying! 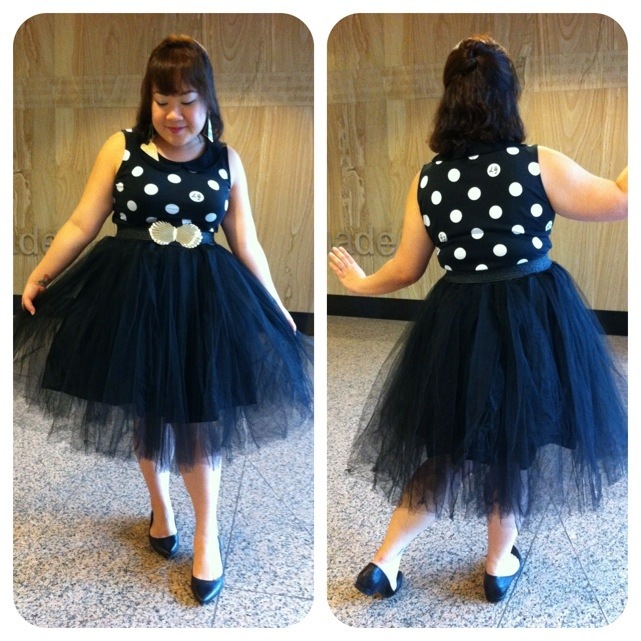 Categories: Fat-shionista | Tags: accessories, asos, blogging, bugis, bugis junction, casio, cute shoes, dress, far east plaza, Fat Friendly, Fat-shionista, fatshion, fatshionista, fonda, fonda accessories, illuma, indie, le bunny bleu, lebunny bleu singapore, online shopping, outfit of the day, plus size, plus-sized, singapore, sponsor, sponsored post, sponsored product, what I'm wearing today | Permalink. Had a nice 3-day weekend as I had taken the day off yesterday. I feel warm and fuzzy all over because I’ve been spending a lot of time with friends. 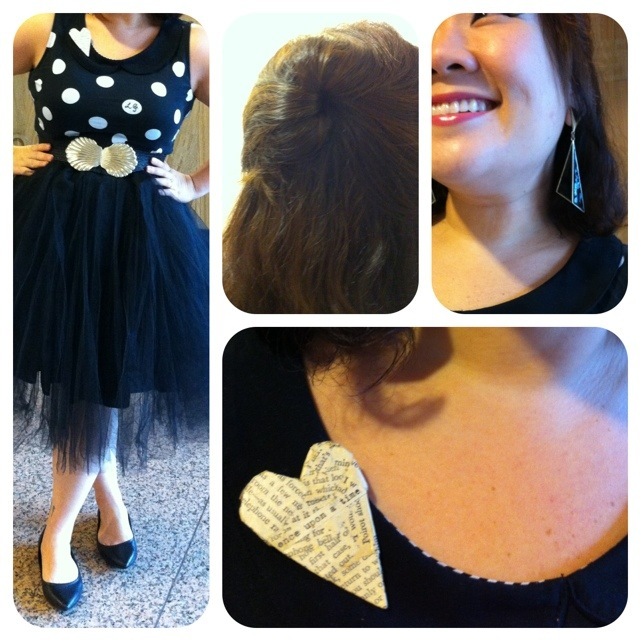 After the Singapore Blog Awards on Saturday, Nat Pixiedub and I went shopping. On Sunday, we had a potluck for lunch with the extended family because my cousin Dawn is back from Hong Kong with her boyfriend Nico for a visit. Afterwards, I spent the entire afternoon till evening at Noel and Stella’s house, playing with their daughter Kate and talking endlessly about random topics with Joe, Little, Joanne, Jay, Nat Pixiedub, Cherry and Jon. And yesterday, I visited Jayne and Edwin’s house to see their newborn Jude. Followed by lunch at i12Katong with Wai Peng and 2-month old Naomi! And today I return to work with a new hairdo! Honestly speaking, I was a little worried when the perming tools were removed and I saw crazy tight ringlets not unlike Shirley Temple. Thankfully though they loosened after being released and washed out. It’s a new look and I’m still getting used to it. I like that it looks shinier and feels softer than it used to. I guess digital perms don’t destroy your hair like regular ones do. What do you think? 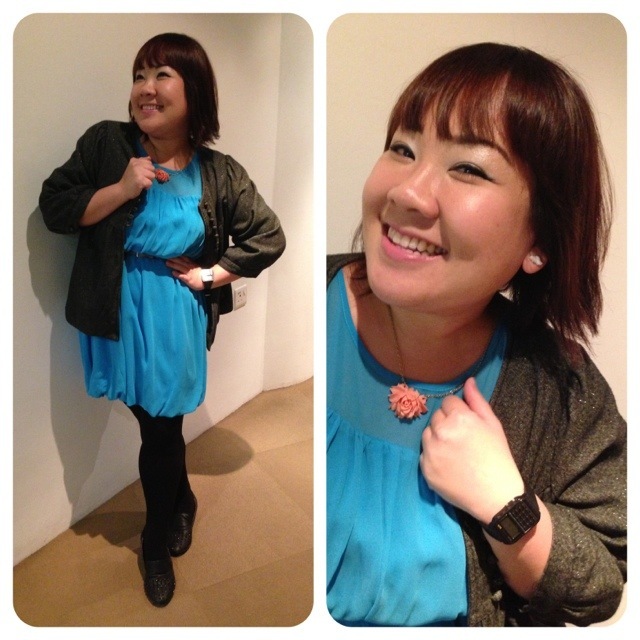 Categories: Fat-shionista | Tags: asos, blogging, casio, dress, H&M, headband, iphone, jean yip, new look, rockport, singapore | Permalink. Thank god for iPhones (or smartphones in general) and the ease is mobile blogging. If it took more effort, I might be posting a lot less. Here’re some quick snaps taken by Tammy on my iPhone, then montages in PicFrame, and uploaded via the WordPress app. Oh dear! On hindsight, I should’ve taken these photos much earlier in the day… Gosh I look washed out! 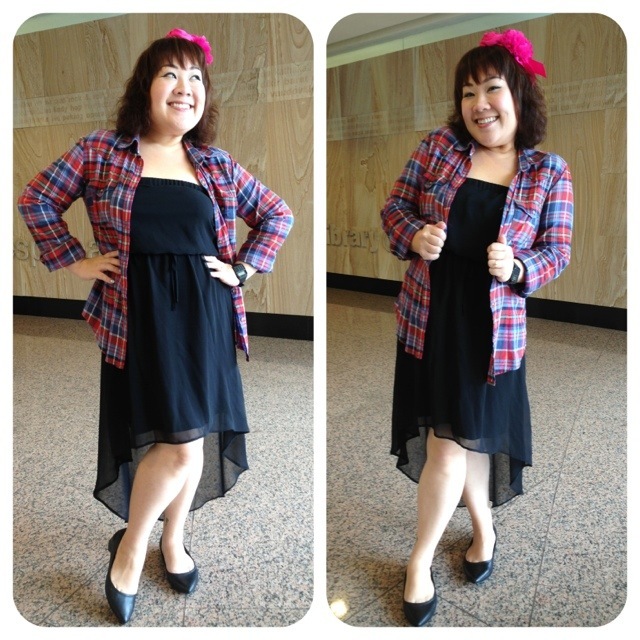 Categories: Fat-shionista | Tags: accessories, asos, atmosphere, blogging, casio, dorothy perkins, dress, eclectic eccentricity, Fat Friendly, Fat-shionista, fatshion, fatshionista, iphone, jacket, leggings, outfit of the day, plus size, plus-sized, primark, singapore, what I'm wearing today | Permalink. Yet another HELL BUNNY dress and I think my last in a while. My closet is bursting again and I am planning to do another massive clear out! Thanks to my photographer Sian Eng! Categories: Fat-shionista | Tags: accessories, blogging, calculator watch, casio, dress, ebay, fancy lady industries, Fat Friendly, fat necklace, Fat-shionista, fatshion, fatshionista, fromtheheel, hell bunny, hell bunny dress, indie, indie designers, iphone, leggings, loubelle shop, online shopping, outfit of the day, plus size, plus-sized, singapore, skulls and crossbones, what I'm wearing today | Permalink.